Easy enough...determine where you will exhaust your hot air, then design your garden so the grow light is conveniently located to the point of exhaust. If the distance is greater than 20 feet, make sure the fan in your setup can handle the extra strain. Try to make the run straight from your lights to the exhaust point, with as few turns as possible. Since hot air rises, you will be removing much more heat from the garden by starting your exhaust near the ceiling of your garden area. This creates a vacuum that naturally pulls cooler, fresh air into the garden from vents located close to the floor. Use an oscillating fan on the floor to keep the cooler, fresh air moving through the plants and toward the exhaust. Fans are much more efficient at PULLING air then they are at PUSHING air. With this in mind, the exhaust fan is usually placed right at the point of exhaust. 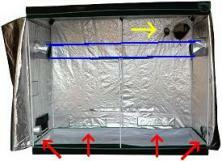 From there it will pull air through your exhaust fan setup (through the light reflector) and out of the garden area. 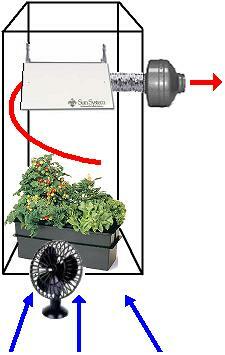 If your garden is in a tight space, like this example, you may need to mount your exhaust fan outside the garden area. Keeping your ballast outside the garden area will also help keep the temperature down inside the garden. 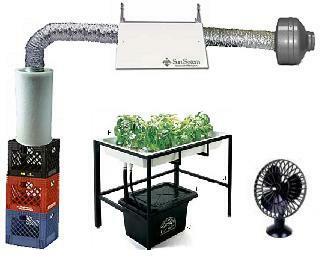 Any garden in a small space will need a good source of cool air. The front door of a closet can be left open, if the temperature of the air in the larger room is cool enough. Otherwise air conditioning will have to be pumped into the garden, either directly or by fans and ducts. This is an ideal exhaust run. The intake on the exhaust system (the carbon filter) is up high to catch the hottest air. 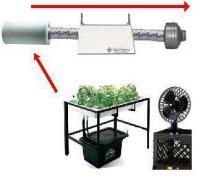 The exhaust run is straight (no turns) and short, and removes much of the heat from the light before it ever enters the grow room. The grow light needs to be run with it's pane of glass in, otherwise the carbon filter will not benefit from the airflow. If you do not have a carbon filter, simply leave it out of the picture. If you cannot attach your carbon filter to the ceiling, try to get it as high up in the garden area as possible. Milk crates might come in handy for this. The exhaust setup in this example should be fine. One side note...the examples here are all shown with centrifugal fans. With no carbon filter, these examples would work fine with squirrel cage fans. These fans are covered in more detail on my garden exhaust fans page.